I’ve been investigating the issue of pacing in transmedia storytelling – he’s my starter for ten; please feel free to discuss! In an interactive, portmanteau-type transmedia story, the author tries to give the audience a good degree of freedom to explore and investigate at their own volition while still aiming to create a satisfying dramatic storyline. Broadly speaking, making these open world, non-linear stories thrilling can be tricky. A central problem of these experiences, assuming that a linear version of the story would be worth reading, is pacing. – tempo – the reaction speed demanded of the player and movement mechanics. 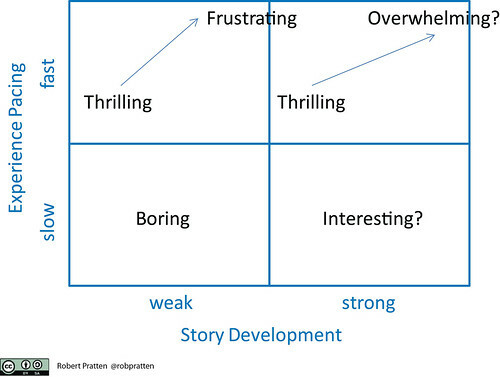 So what can we learn from this that might be applied to transmedia storytelling? I’ve tabulated how these factors might affect pacing in Figure 1 below. Note that no single dimension can be looked at in isolation but must be considered in relation to the others. Discussing pacing in story writing could be a very long section indeed so I’ll take the coward’s route and defer to the books on writing that deal with this – many of which do so from the particular perspective of certain genres. In this post I’m going to focus primarily on the pacing of the experience but as Figure 2 shows pacing of the experience and development of the story need to go hand-in-hand. My only point to make here is that the impact of decisions – both the characters’ and the audience – will ratchet up (big impact) or cool off (minimal impact) the pace. I could have been grouped impact with “easy of decision making” but the impact is particularly dependent on the narrative: it’s the affect of any particular decision on the character or audience. If it’s easy of the audience to do something then the feeling of pace will increase. Having the audience take action depends on the range of actions open to them (the number of choices) and the easy with which they can take an action. The “ease of decision making” depends of the impact of the choice, skill level or prior knowledge. If the audience feels fully equipped and have no dilemma then decisions are made quickly. However, get the audience to pause for thought or problem-solve then progress is slowed. 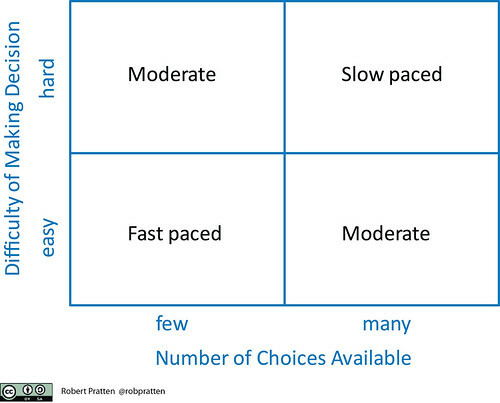 I’ve illustrated this in Figure 3 with a table for considering how decision making and range of choices might affect pacing. Of course it’s not quite that simple because the pause for thought might be for a really engaging story moment – hence possibly increasing the feeling of pace (even though progress has slowed). Having multiple choices or actions available is a good way to have the audience control their own pace – choosing difficult paths (tough decisions to make) or easy paths (no brainers) to suit their mood. Whether all options are mandatory or all remain available after any particular choice is for the author to decide but affects the difficulty of the audience making a decision. Note that one choice may lead to more choices or fewer choices. Restricting or opening up options allows for an effective pacing control but the ease of decision-making must be taken into account. A few tough choices will slow pace while a few easy choices will speed pace. Ultimately the author might purposefully block progress with checkpoints or gates to halt advancement until, say, a certain date and time. This would be achieved by holding back the release of new content and reducing all choices. One way to get the audience to react quickly is to create consequences and benefits of fast decisions. For example, a limited number of prizes, time-limited access to information or increased ranking in a leader board depending on speed of response will all provoke the audience to act quickly. 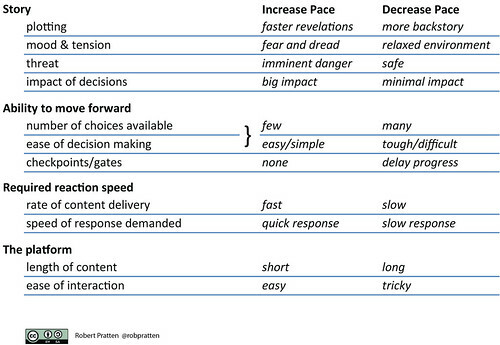 The rate of content delivery will also affect pacing – for example monthly content vs daily content. It’s important that this parameter is tweaked with the content length or else the audience might feel overwhelmed and unable or unwilling to keep up (see Section 2.8 for a full discussion on this). Finally, I believe that the platform used for the content can also communicate pace. For example, mobile SMS messages will tend to urge a faster response (increase pace) whereas, depending on length, a video or blog post might effect a slower response. Similarly, if the audience is expect to travel to a physical location to collect new instructions – this too will slow pace. With short-form messages like Twitter and SMS, pace might be effectively communicated by the rate of delivery. For example, increasing the number of Tweets or text messages per day (per hour?) as the story reaches its conclusion would indicate some urgency. This is very interesting. Pacing in #transmedia storytelling. Have to study this.